Prices do not include the control flags. If you want something different, please ask. Number plates are included with your order. Simply let me know what numbers you would like. I will supply any consecutive series between 31 and 255. 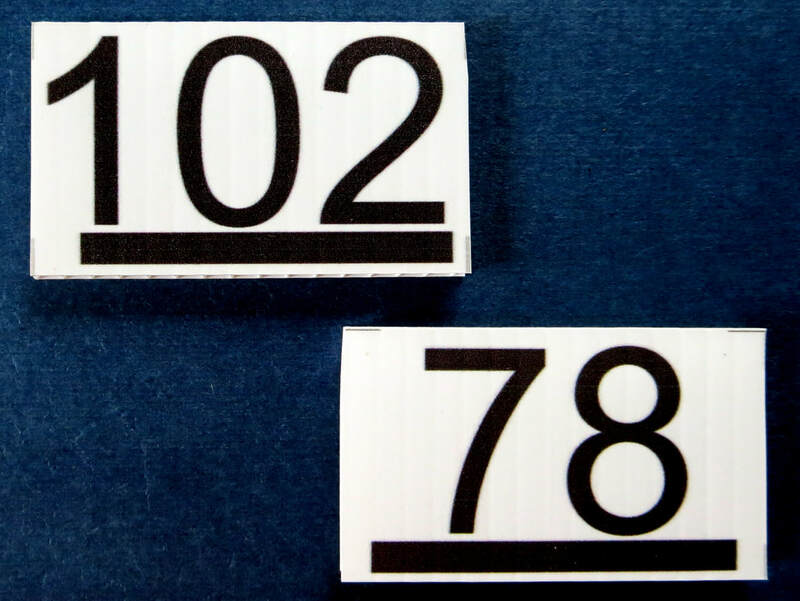 All numbers are underlined, so there should be no confusion resulting from numbers that can be read upside down. IOF requires 3 cm tall numbers. The numbers I supply are all 3 cm tall. Extra number plates can be purchased separately. I subcontract this to a professional sign printer. The cost is about $2.25 per plate, but they should have a long life. You just need to add two parts to the rod to make it secure a flag holder. A. a 1/4 to 5/8 inch (6 to 16 mm) stainless steel hose clamp #4 from plumbing department. I don't want to be involved with shipping rods you can pick up locally. I include instructions on the Stand adaptor page to show how to build the stand. Ask about pricing for these custom designed stands. These are constructed of 1 3/8 X 1 3/8 inch (40 mm X 40 mm) square white PVC stock. Just drive your own steel pipe in the ground and slide the stand onto it. 21, 22, or 27 are exact fits for different size USPS Flat Rate boxes - other amounts will require multiple boxes. I will ship the cheapest way from zip code 44221.
International rate determined at the time of the order. Payment instructions will be given at the time of your order.